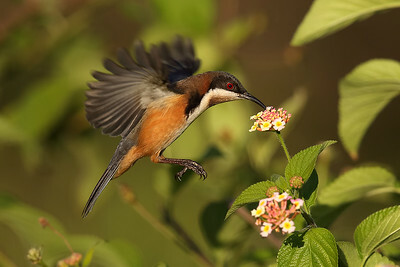 Eastern Spinebill (Acanthorhynchus tenuirostris) adult feeding. New Holland Honeyeater (Phylidonyris novaehollandiae) adult. Noisy Friarbird (Philemon corniculatus) juvenile. This beautiful male was feeding on nectar from a bottle brush flower. Cheeky brush wattlebird. One of the best birds around. Scarlet Honeyeater (Myzomela sanguinolenta) male. Collecting some material to line the nest. Also know as the Little Wattlebird is a honeyeater which also like to eat insects. Also known as the Banana Bird. Juvenile Eastern Spinebill honeyeater feeding on nectar in a bottlebrush tree. A cheeky Red Wattlebird (Anthochaera carunculata) that loved getting its photo taken. Feeding on nectar from lantana flowers.